Blog | Beth at Goodacre & Co. Real Estate | Delivering a real estate client experience that exceeds expectations. 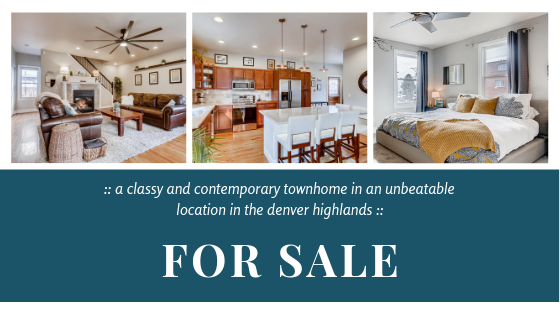 Look no further than this contemporary & classy townhome in an unbeatable location in the Denver Highlands – just a short walk to the Highland’s hottest restaurants. You’ll feel at home once you walk in the door – greeted with an open floor plan and a gorgeous kitchen with new granite countertops, partial butcher block for cooking, and expanded island for entertaining. Upstairs has three bedrooms and 2 full baths – including the 5-piece master en-suite complete with a jetted tub. On the lower level, you’ll be pleasantly surprised with a large media or bonus room and open the french doors to the 4th bedroom (or home office) with attached 3/4 bath. Outside you will find a private, quiet backyard perfect for entertaining or just relaxing. Other updates include new roof (2018), new carpet upstairs (2016), contemporary interior paint, renovated laundry room, new hot water heater (2016), all lighting is LED and was replaced in 2016. This beautiful home in an incredible location has it all – make it yours before it is gone! With this post, I am not trying to pretend like I am a design expert, but being a REALTOR® and someone who is interested in “all things home”, I do read a lot of home articles, posts, and blogs. 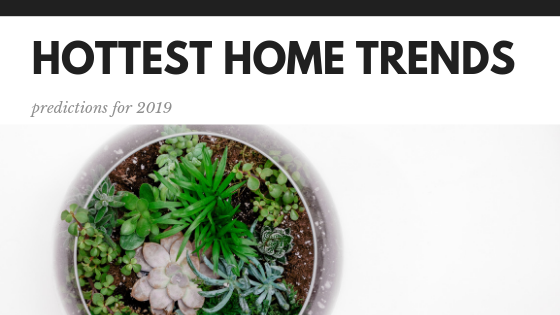 Lately, I feel like one after another is about the hottest trends to expect for 2019 – from paint colors to interior design, furniture design, and overall home. If you have plans for redecorating or want to refresh some of your spaces, it can’t hurt to know what experts believe will be resonating in 2019. I have gathered together some of the more valuable articles I have read and pulled out a few consistent points I am seeing across sources. Pantone declares Living Coral is the color of the year. What it conveys: Life-affirming, optimism, joy. All in all, I believe what is most important is that you make design decisions that resonate well with you & your family. If you aren’t a fan of a certain style, don’t try to force it because some people say it is “in style.” And lastly, I still stand by the importance of timeless design decisions for major renovations if you want to maximize the resale value of your home which I touch upon in my last blog post: Home Renovation Projects that Boost Resale Value of Your Home. Kitchens. Nearly every buyer is pleased when they see a beautiful kitchen, even buyers that aren’t afraid of projects. Kitchen remodels can be expensive so even if the rest of the house needs work, buyers are happy to see that one project checked off the list. If you are planning any home project, starting with a kitchen update really should pay off in the end. Overall make sure the layout is functional – does the flow work for cooking & entertaining? Know that plenty of counterspace & storage is important to buyers and many will be pleased with an island in the kitchen as long as it doesn’t make the space too cramped. New energy-efficient appliances will benefit you as a homeowner and look appealing to future buyers. 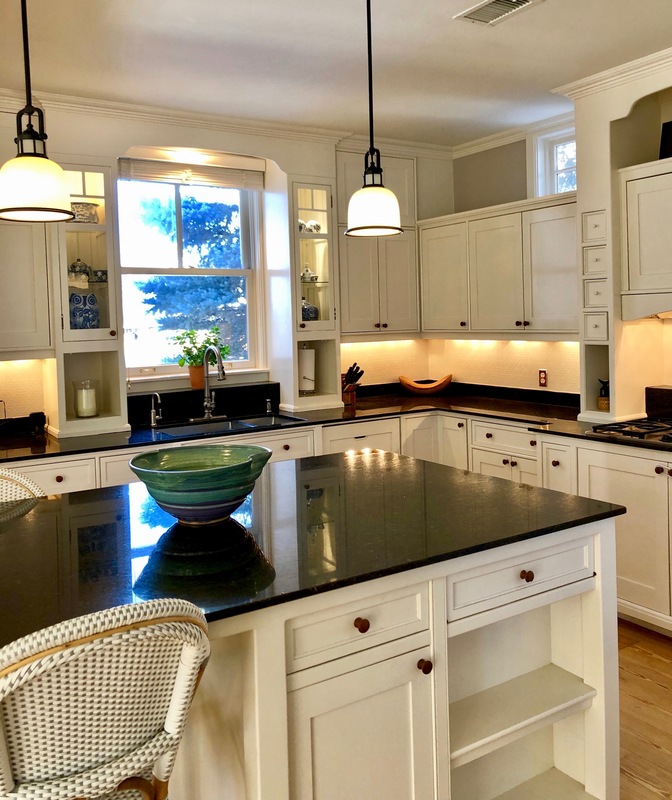 Finally, if you are going to update things like cabinets, countertops, the backsplash, and lighting try to stay with design decisions that are timeless. Any unique features that only appeal to a certain type of audience will narrow the pool of buyers that appreciate the work put into the kitchen. Bathrooms. After the kitchen is done, move onto the bathrooms. Same rule applies with keeping the updates appealing to a broad audience. You want to create an attractive space that has a clean and updated feel. You can still have fun with your updates – maybe consider an accent wall behind the vanity or toilet or new, modern mirrors & lighting. Keep in mind that many buyers still want at least one tub in their home so don’t plan to get rid of all bathtubs in your house, no matter how trendy those stand-alone showers are. Energy efficiency. The next item that will pay off for both you as a homeowner & for resale is how efficient the home is. Check the age of the furnace or boiler, hot water heater, & A/C units – consider updating with new models that work more efficiently. Leaky doors and windows affect your heating and cooling bills and is something buyers will notice. If you don’t want to replace your windows & doors, you can update weather-stripping or reseal the windows to see if that helps. If you have poor insulation in the house, you can improve the quality of the insulation. Exterior. First impression makes a difference so investing in exterior updates will be beneficial as well. Consider an exterior paint refresh, especially if you have chipping or fading paint. If you are looking for a change, but don’t want to repaint the whole house, choose a fresh new color for the front door. For an affordable update that makes a big difference, swap out any exterior lights that may not be working or are outdated and replace with a fresh, modern look. Lastly, investing in your yard and garden will help you better enjoy your home & have buyers see that you not only have a great house, but a great property. Be careful with adding unique additions that may turn away future buyers such as an elaborate water feature. A koi pond, for example, may look beautiful to some, but to others it may just look like a lot of work or even a dangerous hazard to a buyer like a family with young children. Look at your floors. If you have carpet, tiling, or wood floors that have seen better days, investing in an upgrade or refresh for the floors will be a smart decision. Flooring can really stand out — making the whole house feel clean & inviting or put off the opposite effect if the floors are in bad shape. Focus on what you can afford – making sure to at least to update the flooring in the rooms you renovate (such as the kitchen & bathrooms) and expect to have to price the house accordingly if the floors in other areas of the home really need work. If resale value is a major concern of yours, talking to a local REALTOR® to get their advice before starting the project can be very beneficial. If you are in the Boulder/Denver area, I would love to help! Please reach out via the contact information below or email me at beth@goodacreproperties.com. Talk with a REALTOR® you trust. My advice is that it is never too early to loop in a REALTOR®. They can give you insight on things like the best month to list your home, some suggestions for updates to make to your home to maximize your profits, and prepare you for what to expect. If you will be listing a few months out, now is a good time to start sprucing up your home. Tackle those projects that you know must be done — from cosmetic updates that will be eyesores to potential buyers to the big items that you know may come up in an inspection. It can’t hurt to service items like the central A/C unit, furnace, and have the chimney cleaned. Organize dates & documents that buyers may request like age of the roof, age of appliances, dates of latest services, HOA documents, typical monthly utility bills, and warranties. This will help answer questions from serious buyers considering purchasing your home & save time during the transaction. You cannot hide from bad news with your house — seller’s failure to disclose known material defects with the house may result in legal liability. 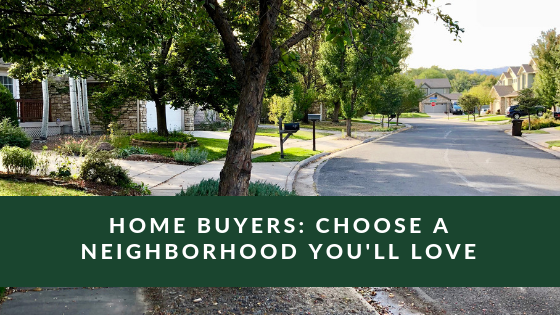 Consider your options for “where to next” and plan for the scenario where your home sells fast. If you are planning on buying another home, remember that it usually takes at least 30 days to close on a home if you are getting a loan. You are going to want to talk with your REALTOR® about your options if you are buying & selling at the same time, as well as a lender if you plan to get a loan on your next home purchase. You don’t want to be left homeless with no plan in place! Start to de-clutter and prepare for the move. Less “stuff” in a house looks better to potential buyers and will help make the transaction period less stressful for you. You will have a lot of to-dos with the real estate transaction itself, the less stress you have with packing up & moving, the more you will thank yourself. Once you & your home are prepared for the sale, your REALTOR® will get to work listing your home for sale. 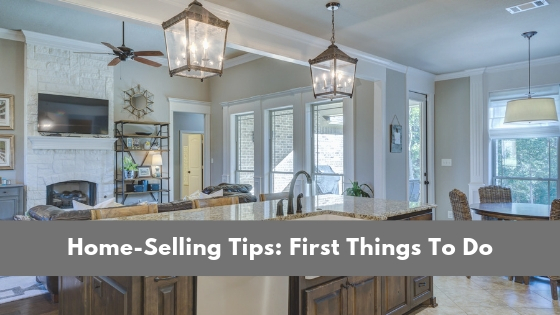 You may want to review my past blogs on “Improving Your Home’s First Impression” & The Seller’s Roadmap to further prepare yourself for the sales process. Once your home is listed – support your REALTOR® and respect their opinion on the process. Try to be as flexible as you can with showings & open houses and keep your house clean & presentable. The easier it is for buyers to come in and see your home, the more traffic you will get with prospective buyers. The more enjoyable the experience is for the buyer in your home, the more positive of an impression it will have on them. Good luck & happy selling! If you need assistance from a local REALTOR® to sell your home in the Boulder-Denver areas, I would love to help!! Please reach out via email at beth@goodacreproperties.com or through the contact info below. Here are five tips to help you choose a home in a community that is right for you. Overall ask yourself about the type of scene you are looking for in a neighborhood – a quiet one or a more lively scene. You may love hanging out in a particular part of town, but when it actually comes to living there, you may find that all the other people hanging out there too & making noise isn’t exactly what you had in mind. How did you feel on your first impression of the neighborhood? Did you mind that there were RVs and cars parked all around on the road and in driveways? Did you see many houses that are run down or yards that need work? Neighborhood associations often have rules around parking on the roads, general upkeep, and even aesthetics of the houses. If you are concerned about the appearance of your neighborhood as a whole, maybe a one with a HOA is the right for you. If you didn’t have a good feeling at first of a particular neighborhood, you may want to stick to your gut. Decide if walkability is important to you and if so – make sure you understand what is defined as within walking distance. For example – if you see a house listed as highly walkable, you may have an image of walking to cute “Mom & Pop” shops and cafés only to realize, it is walking distance to a strip mall with only fast food chains and a gas station. Go visit the house and park the car… walk around and get a feel for the neighborhood & the walks you will go on. While you are out walking, talk to the neighbors. What better way to really hear the ins and outs of an area than from a neighbor that already lives there. There may be complaints or positive features that aren’t obvious from you quick visits. Check the surrounding features such as whether there are parks or walking trails close to the house. Also look for elements that may affect the day-to-day living like being near a loud, active train or even a tourist attraction that will bring heavy traffic. It is also good to look at the school ratings in the area even if you don’t have children as higher rating schools will be better for resale. In the end, you want to get into a home you love in an area that is right for you. Taking the extra steps to really study the area as much as the home will pay off in the end. If you or anyone you know needs help on their Boulder-Denver home buying search, I’d love to help! Please reach out through the contact form below or emailing me at beth@goodacreproperties.com. Selling? Improve Your Home’s First Impression. #1. Make sure you take care of the major items to prepare your home for sale like touching-up paint, making necessary repairs around the house such as broken or damaged items, cleaning carpets of obvious stains, and sprucing up your yard. You want your house to be in it’s best shape to get top dollar. See my earlier blog on The Seller’s Roadmap if you aren’t sure on the process of selling your home. #2. Make sure you hire a realtor that will coordinate professional photos for you. 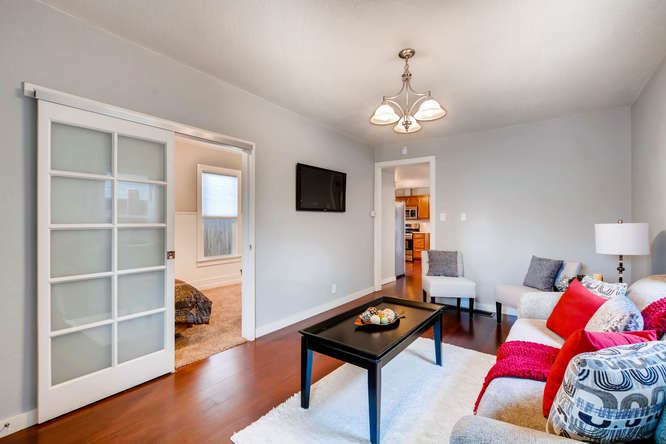 Most realtors should offer to pay for these photos – if they try to convince you they can just take the photos on their phone, I’d highly suggest you start looking for a new realtor! You (and your home) deserve better. Professional photos will help make your home shine. #3. Talk with your realtor about whether it is worth the investment to stage your home. Houses that are vacant or have furniture that have seen better days may really benefit from home staging. Putting away & organizing major clutter. Try to clean off counters, tops of furniture (such as coffee tables & desks), tidy up shelving that may be overflowing with personal items, tuck away pet supplies, and put away laundry. Minimize toiletries in bathrooms & freshen the space. Too many products on the counters may imply there is not enough storage. Plan for the photographer to open shower curtains for the photos so try to keep the shower/bathtub clean & clutter-free. Check all light bulbs and replace ones that are burnt out. The photographer will likely want all the lights turned on and it will look funny if one of two bathroom lights are out, for example. Don’t forget exterior lights! Do a thorough clean of your house. Consider a professional carpet clean if the carpets are particularly dirty & stains visible. Spruce up the yard and outdoor space. Wash off dirty outdoor furniture, clean-up the yards and gardens, pull any dead plants, mow the lawn, put away children’s toys and games. Feel free to add some additional greenery inside or out with plants, but be careful about dating the pictures to a specific holiday in case your house doesn’t sell as quickly as you hope. Hide electrical cords, including any jumble of wires that may be visible under your TV console or desk. #5. On the day of the photos, you’ll want to do a final run through sprucing up your property. Clean counter-tops and do another round of de-cluttering. Put away the majority of items on the kitchen counters such as dish drying racks, extra appliances, utensil holders, spices, etc. You want to make your counters look as spacious as possible. Wipe down hardwood & tiled floors and try to get your appliances to shine, especially stainless steel that easily show smudges. Make all the beds and ensure pillows & throws look tidy on furniture. Clean windows of smudges & dirt which can show up in photos and take away from the pretty windows or views. Toilet seats down & neatly fold any hand towels around the house. Turn on all lights – don’t expect the photographer to do that for you. Finally, after the photos are taken – it is still important to keep the house in excellent condition for the showings. Nice photos will help get people into your house, but you want them to be impressed once they are there too. Keep the house clean, tidy, and odor free while the house is on the market! If you are thinking about selling your home in the Boulder/Denver area, I would love to help. I always provide professional photos for my clients, advice on updates or tips to help the house sell for top dollar, an innovative & custom marketing campaign around each listing, and I always strive to exceed my client’s expectations with exceptional client service. Please email me below for more information on how we can work together & to see my sample listing marketing plan. As the days start to get a little cooler and there is a chill in the evening air, most of us can’t help but think about the fall days ahead. With that comes cozy warm layers, hot drinks, comfort foods, and the start of the leaves changing colors (my favorite time of year!). However, with this transition also comes a home to-do list you will want to consider to prepare your house for colder days ahead. Read below for some key things to plan for. Do an initial check of your roof & gutters. It’s generally fine to wait until the majority of the leaves have fallen to clean out gutters and downspouts, but now is a good time to check for debris, fallen sticks, or seals that look worn-out. Make sure you don’t see obvious signs of damage or wear on your roof, especially around vent pipes and chimneys. If you do, schedule repairs before the harsh winter starts as worn seals or damage could cause house leaks. Schedule chimney clean-ups. Make sure your fireplace is clean & safe for the upcoming year, especially if you have a wood-burning fireplace. A dirty chimney can be a fire hazard. Creosote, the sticky substance that remains after a fire, is highly flammable. A chimney sweep is an easy & relatively cheap maintenance item you should not avoid. Touch-up exterior paint. One of my first blogs was about how important it is to stay on top of exterior paint. Review your exterior for chipping paint and prioritize touching-up areas where you know snow may accumulate in the winter. Schedule a tune-up for your heating system. Make sure your heating system is working optimally by scheduling a tune-up. Depending on the age of your system, you may only need one every other year. Ask your heating professional how often to schedule so you are aware moving forward. Cover-up or remove A/C Units. September is the time to remove A/C window units – it is ideal to remove them vs. putting on a cover as it minimizes winter heat loss if you can close the window. If you have central A/C, you’ll want to turn the system off to avoid it flipping on in an unusually warm winter day. Hose or blow off the air conditioning unit to remove leaves, small branches, dirt and dust. Ensure it dries completely and then cover the A/C unit with a protective cover for the season. You may want to call a local HVAC company to see if there are other preventative items you should do to keep your system in good condition over the winter. Order Firewood. If you have a wood-burning fireplace, now is a good time to order a delivery of firewood for the season. If you can, don’t store large quantities of wood directly against the house, which can encourage bugs & pests, but do keep it covered from moisture such as rain and snow. Schedule to winterize your sprinkler system. When temperatures start to fall, it’s time to winterize your sprinkler system. Your lines must be drained or blown out before the first hard freeze as the sprinkler system can be damaged from below-freezing temperatures. Add weather-stripping. For old, drafty windows and doors, weather-stripping can help retain heat and stop drafts. Check old weather-stripping to ensure it is working properly and help ensure window & door gaps are as sealed as possible for the upcoming cold days. 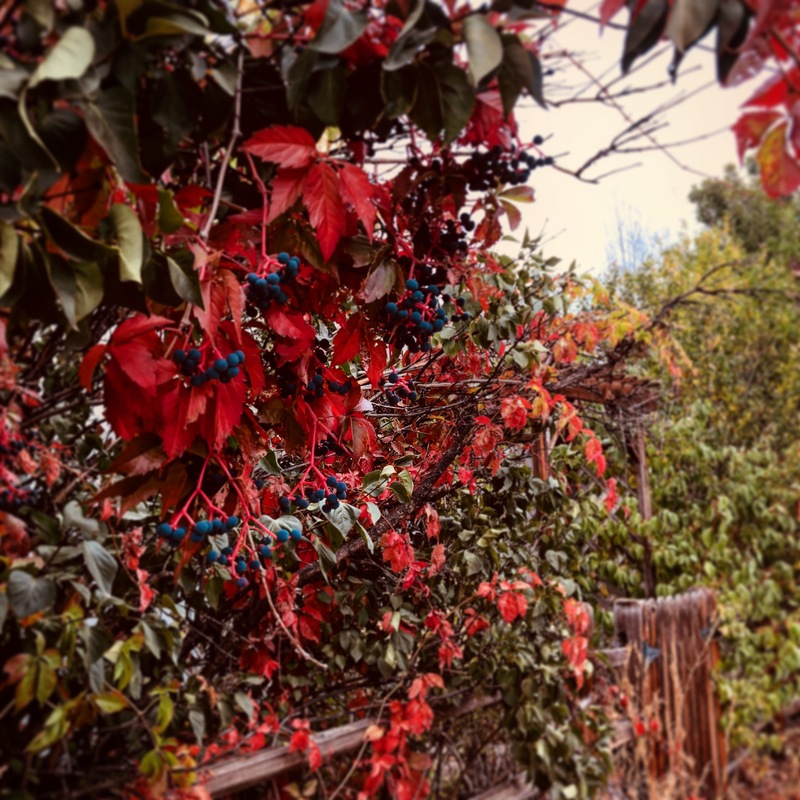 After all your hard work, plan to enjoy the wonderful season of fall! Go buy a new candle (I love Yankee Candle’s Autumn Leaves) and plan a foliage drive to see the gorgeous changing leaves in your area. Enjoy! Real Estate Tip: Properly maintaining your HVAC systems, roof, & chimney will help avoid costly surprises at inspection objection if you are trying to sell your home. If you have any questions related to preparing your home for sale, I would love to help. Please contact me below. 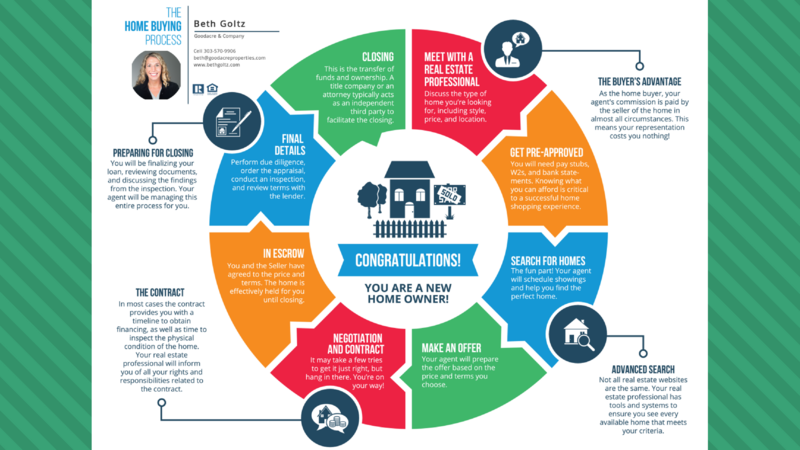 As a follow-up to my last blog about the home selling process, here is a guide for the other side of a real estate transaction – the home-buying process. 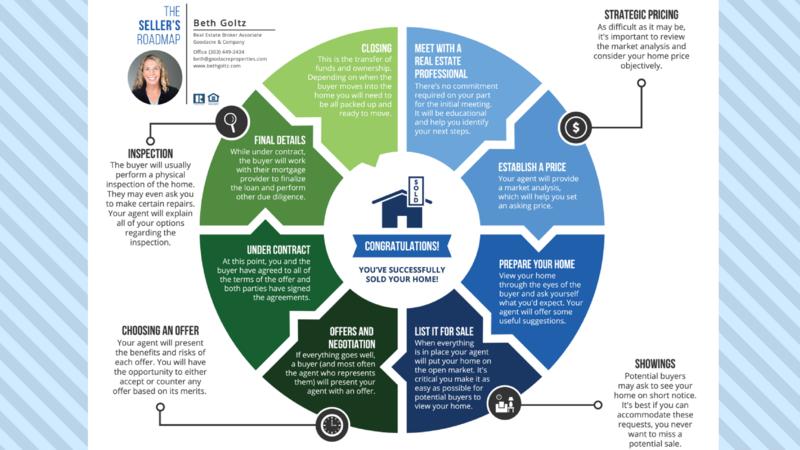 As with selling your home, the process to buy a house can seem complex and confusing at times. Luckily, you can get help from a real estate professional who will guide you through the process every step of the way. One thing some first-time home buyers don’t realize is that in most circumstances, the agent’s commission is paid for by the seller of the home, not the buyer. So this means your representation should cost you nothing! When you meet with a real estate professional, you will want to discuss what you are looking for in a home & ideal location so they know the parameters of your home search. Your realtor will likely ask you pretty early on if you will be requiring a loan or paying cash. If you are getting a loan, you will want to get pre-approved by a lender right away. This helps ensure you are searching for homes in an accurate price-range and when it is time to put an offer on a house, you can quickly have a pre-approval letter to give with your offer showing you can afford a house of that amount. Having this pre-approval completed at the start will make the process move a lot more smoothly. If you aren’t sure where to start with finding a lender, your broker may be able to provide recommendations. The fun part is searching for a home! Your realtor will search for homes in your criteria & schedule showings as appropriate. When you are looking at homes, it is important to think beyond just the obvious like number of rooms, size of kitchen, and age of the roof. You may want to visit my blog post about important things to consider when buying a house. There is no magic number on the amount of homes you should see before you make an offer. I always tell my buyers you need to have the right feeling with a house – you should feel at home in it to know it is right for you. Once you find the right home, your agent will prepare the offer based on the price and terms you choose. Often there will be some form of negotiation on both sides and once the parties come to an agreement, you are under contract! The contract will dictate the dates, deadlines, & terms that must be met before closing & possession – these include items like the inspection, appraisal, due diligence documents, record & off-record title, property insurance, loan deadlines, and more. Your broker should keep you up to speed on all upcoming deadlines and what to expect. If you are getting a loan, you will also be getting a lot of requests from the lender on information you need to provide. Staying on top of both of these will help make the process as smooth as possible and not risk delaying close (or worst case, terminating the contract). The last deadlines will be the closing date & possession (not always the same date). Closing is the transfer of funds and ownership & the day we are all looking forward to! A title company or an attorney typically acts as an independent third-party to facilitate the closing. Post closing & at the time of possession you can celebrate your new home and the new title of being a home owner! Congratulations!! I would love to help you find your next home! Please contact me below if you have any questions on the home buying process or would like to discuss how I can help you with you real estate needs. Visit my testimonials page to see what others have to say about working with me. Selling your home can be an emotional process so it’s best to go into it knowing what to expect. If you are thinking of selling your home, you will first want to meet with a real estate professional so they can help walk you through the steps to getting your home sold. There is no commitment for that initial meeting – you are ensuring that you & the real estate broker will work well together and the work the broker will put into selling your home is what you expect (and deserve!). The broker will do a market analysis and pull comparable homes that have sold recently to determine an appropriate price for the house. As difficult as it may be, it is important to review the facts and be open-minded about the price the agent is providing. Many sellers have an emotional tie to their home and may see their home in a more subjective light than the traditional buyer will. If you decide to move forward with listing your home, you will want to prepare your home to be sold. A good real estate broker should be able to help provide insight into what buyers will be looking for – plan to be open-minded in hearing their recommendations. Your broker is offering advice based on a broad buyer audience, whereas your style may be more for one particular taste. You will want your home to be in the best possible condition so plan on things like touching-up paint, making repairs for defects such as a broken door or leaky roof, de-clutter, enhance your home’s curb-appeal, eliminate odors, and clean to make your house shine. Once your home is ready, your broker will list it for sale. At a minimum, your broker will put up a for-sale sign and list it in the local MLS (Multiple Listing Service). You deserve more than this so ensure your real estate broker will be putting forward a full marketing plan to sell your home from events to advertising, social media, direct outreach, professional photos, and more. The job of a real estate agent is to MARKET your property to get it sold. You need an agent that knows how to do marketing to get the home sold quickly and at a sale price you are happy with. Please contact me below for a sample of my marketing plan for listing homes. When an offer (or multiple offers) come in on your home, your broker will work with you to help you decide which offer to move forward with or negotiate on. When all parties agree to the offer, the contract is signed and you are officially under contract. Be prepared for many deadlines & commitments in the following weeks to get the sale closed. On top of preparing to move and meeting all seller obligations, it is going to be a very busy couple of weeks. Assuming each date & deadline is met and no one defaults on the contract, the transaction is complete with the closing & agreed upon possession date & time. Cheers!! Download the Seller’s Roadmap here. I would love to help you sell your home in CO. Please contact me below to see my sample marketing plan for listing homes & I would be happy to schedule a no-obligations meeting to discuss your real estate needs.